The wood products we use every day— furniture, kitchen cabinets, musical instruments, and more— are produced by highly skilled woodworkers. Woodworkers make wood products from lumber and synthetic wood materials. The modern woodworking trade is highly technical; while some continue to work with traditional methods in small workshops, most woodworkers use automated machinery, such as computerized numerical control —or CNC—machines, working in high-production assembly line facilities. Machine woodworkers set up the equipment, cut and shape wooden parts, and verify dimensions. They apply fasteners and adhesives and assemble the parts into finished units. To complete a piece, they install hardware, and fit products for glass, metal trims, electrical components, and stone. Finally, they sand, and apply finishes. Cabinetmakers and bench carpenters make wood pieces, and design custom cabinets to customers’ specifications, then build and install them. Furniture finishers do the finishing work of staining, sealing, and top coating wooden products. They also refinish furniture, and may work with antiques to preserve and repair them. Workers may handle heavy materials and be exposed to noise and dust. Injuries occur at a higher rate than in many other jobs. Protective gear, including safety glasses, respirators, and hearing protection devices, are worn for many jobs. Most woodworkers work full time during regular business hours. 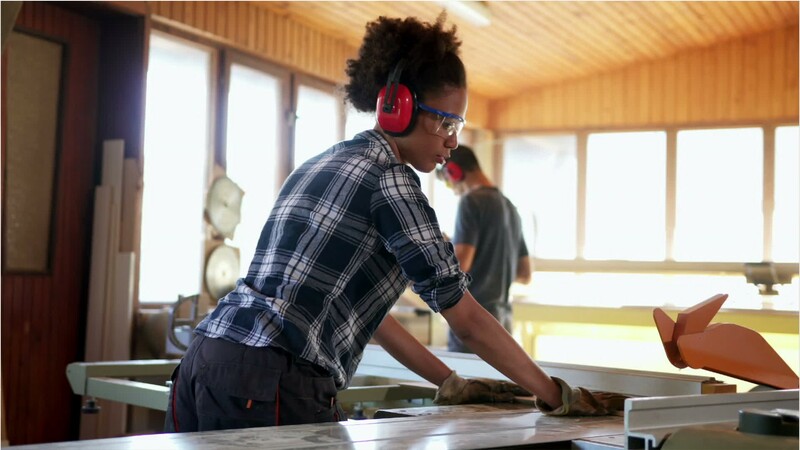 A high school diploma or equivalent is typically required for woodworkers. Full proficiency may take several years of on-the-job training. See more details at O*NET OnLine about cabinetmakers and bench carpenters. Cabinetmakers & Bench Carpenters by U.S. Department of Labor, Employment and Training Administration is licensed under a Creative Commons Attribution 4.0 International License.